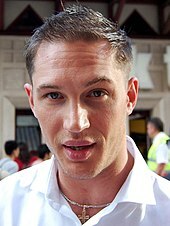 Edward Thomas Hardy CBE (born 15 September 1977) is an English actor and producer. After studying method acting at the Drama Centre London, Hardy made his film debut in Ridley Scott's Black Hawk Down (2001) and has since appeared in such films as Star Trek: Nemesis (2002), RocknRolla (2008), Bronson (2008), Warrior (2011), Tinker Tailor Soldier Spy (2011), Lawless (2012), Locke (2013), The Drop (2014), and The Revenant (2015), for which he received a nomination for the Academy Award for Best Supporting Actor. In 2015, Hardy portrayed "Mad" Max Rockatansky in Mad Max: Fury Road and both Kray twins in Legend. He has appeared in three Christopher Nolan films: Inception (2010), The Dark Knight Rises (2012) as Bane, and Dunkirk (2017) as an RAF fighter-pilot. He starred as Eddie Brock / Venom in the antihero film Venom (2018). For other people named Tom Hardy, see Thomas Hardy (disambiguation). Hardy's television roles include the HBO war drama miniseries Band of Brothers (2001), the BBC historical drama miniseries The Virgin Queen (2005), Bill Sikes in the BBC’s miniseries Oliver Twist (2007), ITV's Wuthering Heights (2008), the Sky 1 drama series The Take (2009), and the BBC historical crime drama series Peaky Blinders (2013–2017). He created, co-produced, and took the lead in the eight-part historical fiction series Taboo (2017) on BBC One and FX. Hardy has performed on both British and American stages. He was nominated for the Laurence Olivier Award for Most Promising Newcomer for his role as Skank in the production of In Arabia We'd All Be Kings (2003), and was awarded the 2003 London Evening Standard Theatre Award for Outstanding Newcomer for his performances in both In Arabia We'd All Be Kings and for his role as Luca in Blood. He starred in the production of The Man of Mode (2007) and received positive reviews for his role in the play The Long Red Road (2010). Edward Thomas Hardy was born on 15 September 1977 in Hammersmith, London, the only child of artist and painter Anne (née Barrett) and novelist and comedy writer Edward "Chips" Hardy. He is of Irish descent. Hardy was brought up in East Sheen, London. He studied at Tower House School, Reed's School, and Duff Miller Sixth Form College. He later studied at Richmond Drama School and the Drama Centre London, a part of Central Saint Martins. He has named Gary Oldman as his "hero", adding that he imitated scenes from the actor while at drama school. In 1998, Hardy won The Big Breakfast's Find Me a Supermodel competition at age 21 (and with it a brief contract with Models One). Hardy joined Drama Centre London in September 1998, and was taken out early after winning the part of US Army Private John Janovec in the award-winning HBO-BBC miniseries Band of Brothers. He made his feature film debut in Ridley Scott's war thriller Black Hawk Down (2001). During this time, Hardy also had a brief stint as a rapper and hip hop producer with his friend Edward Tracy (under the name "Tommy No 1 + Eddie Too Tall"), with whom he recorded a mixtape called Falling On Your Arse In 1999 that remained unreleased until 2018. In 2002, Hardy gained some heavy international exposure as the Reman Praetor Shinzon, a clone of USS Enterprise Captain Jean-Luc Picard in Star Trek: Nemesis. The following year, he appeared in the film Dot the i, and then travelled to North Africa for Simon: An English Legionnaire, a story of the French Foreign Legion. He then returned to the United Kingdom to feature in the horror film LD 50 Lethal Dose (2003). Hardy was awarded the 2003 London Evening Standard Theatre Award for Outstanding Newcomer for his performances in Blood and In Arabia We'd All Be Kings performed at the Royal Court Theatre and Hampstead Theatre. He was also nominated for a 2004 Laurence Olivier Award for Most Promising Newcomer of 2003 in a Society of London Theatre Affiliate for his performance as Skank in the aforementioned production of In Arabia We'd All Be Kings. Hardy appeared with Emilia Fox in the BBC miniseries The Virgin Queen (2005) as Robert Dudley, a childhood friend of Elizabeth I. Dudley's character has been described as an ambiguous young man who is torn between the affection of his wife (played by Fox), his love for Elizabeth and his own ambitions. Hardy featured in the BBC Four adaptation of the 1960s science fiction series A for Andromeda. In June 2009, Hardy starred in Martina Cole's four-part TV drama The Take on Sky One, as a drugs and alcohol fuelled gangster. The role gained him a Best Actor nomination at the 2009 Crime Thriller Awards. In August 2009, he appeared in ITV's Wuthering Heights, playing the role of Heathcliff, the classic love character who falls in love with his childhood friend Cathy. In early 2010, Hardy starred in The Long Red Road at the Goodman Theatre in Chicago. The play was written by Brett C. Leonard and directed by Philip Seymour Hoffman. Hardy won some good reviews for his portrayal of Sam, an alcoholic trying to drink away his past. In 2010, he starred as Eames in Christopher Nolan's science fiction thriller Inception for which he won a BAFTA Rising Star award. Hardy replaced Michael Fassbender in the 2011 film adaptation of Tinker Tailor Soldier Spy, released on 5 September 2011 at the 68th edition of the Mostra Internazionale d'Arte Cinematografica in Venice. In March 2010, Hardy signed a first look deal at Warner Bros. In 2011, Hardy starred in the film Warrior, which was released on 9 September 2011 by Lionsgate Films. His performance as Tommy Riordan, who is trained by his father to fight in a mixed martial arts tournament against his brother, gained praise from critics. Hardy also starred in This Means War (2012), a romantic comedy directed by McG. He played the supervillain Bane in The Dark Knight Rises, the final film in Christopher Nolan's The Dark Knight Trilogy, released on 20 July 2012. He played a bootlegger in John Hillcoat's crime drama Lawless (2012). Hardy has signed up to play the lead role of Sam Fisher in Ubisoft's upcoming film adaptation of their video game series Tom Clancy's Splinter Cell. He also appeared in Riz Mc's music video for the song "Sour Times". In 2014, Hardy starred in the crime film The Drop alongside James Gandolfini, in what would be the latter's final appearance in a feature film before his death. Hardy also joined the cast of the BBC crime drama Peaky Blinders in its second series. He portrays Alfie Solomons, the head of a Jewish gang and runner of a distillery which disguises itself as a bakery. Hardy starred in five films in 2015. The first, Child 44, set in 1950s Soviet Union, saw him playing Leo Demidov, a Soviet secret police agent who investigates a series of child murders. Despite mild praise for his acting, Child 44 was reviewed negatively by critics and was a box office failure. Hardy then played the title character, Max Rockatansky, in the action film Mad Max: Fury Road (2015). His performance was praised by critics and overall the film received critical acclaim and became a box office success, grossing over $378 million against a $150 million budget, becoming the highest-grossing film in the Mad Max franchise. He played a dual role as London gangsters Reggie and Ronnie Kray in the crime thriller Legend (2015). On 7 December 2015, Hardy won Best Actor at the British Independent Film Awards for his portrayal of the Kray twins, and on the same night attended the premiere of the biographical western thriller The Revenant, in which he co-stars with Leonardo DiCaprio, at Leicester Square, London. On 14 January 2016, Hardy received his first Academy Award nomination for Best Supporting Actor for his performance in The Revenant. Hardy played a Royal Air Force fighter pilot in Christopher Nolan's action-thriller Dunkirk (2017), based on the British military evacuation of the French port of Dunkirk in 1940 during the Second World War. He appeared alongside Mark Rylance, Kenneth Branagh, Cillian Murphy and Harry Styles. Hardy also co-produced and starred in the eight-part BBC One television drama series Taboo. It was created by Hardy, Steven Knight, and Hardy's father, Edward "Chips" Hardy. Taboo was aired in the United States by FX. 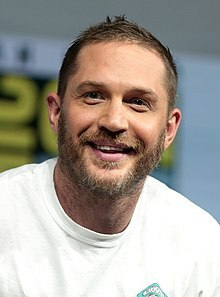 In 2018, Hardy starred in the film Venom, as the title comic book sometime hero, Eddie Brock / Venom. Based on the Marvel source material, the film was released on 5 October, and is meant to be the start of "Sony's Universe Of Marvel Characters" (along with Silver and Black). It is connected to the Marvel Cinematic Universe as an "adjunct" film. In 2019, Hardy will star in Josh Trank's Al Capone biopic Fonzo. Hardy is also attached to star as iconic war photographer Don McCullin in a film based on McCullin's autobiography, Unreasonable Behaviour. Hardy married producer Sarah Ward in 1999; they divorced in 2004. He has a son (born 2008) with his then-girlfriend, assistant director Rachael Speed, whom he met on set of The Virgin Queen in 2005. They separated in 2009 after four years together. In 2009, Hardy began a relationship with actress Charlotte Riley, after they met on the set of Wuthering Heights. They were married in July 2014. In October 2015, their first child was born. In January 2019 the couple’s second child, a son, was born. They had two rescued dogs, Max and Woodstock, one of which Hardy appeared with in a PETA advert to promote pet adoption. Woodstock died on 5 June 2017 due to an aggressive case of polymyositis. In 2010, Hardy became an ambassador for the Prince's Trust, a leading UK youth charity which provides training, personal development, business start up support, mentoring, and advice. In 2012, he and Riley became patrons of Bowel Cancer UK. Prior to the inaugural Invictus Games held in London in September 2014, Hardy, along with other entertainers and athletes, read the poem "Invictus" in a promotional video. Hardy was named one of GQ magazine's 50 best dressed British men in 2015. One of the highest profile actors in contemporary British popular culture, Hardy appeared on Debrett's 2016 list of the most influential people in the United Kingdom. Hardy was appointed Commander of the Order of the British Empire (CBE) in the 2018 Birthday Honours for services to drama. Hardy was addicted to alcohol and crack cocaine during his mid-20s, after which he checked himself into rehab following a particular low point. He has said that he was 'out of control' on drink and drugs before he turned his life around, and was lucky that he did not contract HIV while he was at his lowest. During the filming of Bronson, Hardy met with prisoner Charles Bronson several times and the two became friends. Bronson was impressed with how Hardy managed to get as muscular as he was and how well he could mimic his own personality and voice. Bronson has stated he believes Hardy was the only person who could play him. 2001 Band of Brothers John Janovec Episodes: "Why We Fight", "Points"
↑ Swift, Andy (23 November 2015). "Tom Hardy's FX/BBC One Drama Taboo Adds 13, Begins Production". tvline.com. Retrieved 16 January 2017. ↑ Young, Niki May (20 January 2012). "Celebrity patron Tom Hardy helps save homelessness charity from closure". Civil Society. Retrieved 16 June 2018. ↑ "For Tom Hardy, Adoption Is the Only Option". PETA. Retrieved 16 June 2018. ↑ "British Stars Take A Run At Beating Cancer". Sky News. 8 September 2014. Retrieved 16 June 2018. ↑ "Dalglish and Thompson head honours list". BBC News. 9 June 2018. Retrieved 16 June 2018. ↑ "From rehab to royal honour: Tom Hardy is made a CBE". The Irish News. 8 June 2018. Retrieved 16 June 2018. ↑ Hadfield, Tom (25 August 2011). "Tom Hardy timeline". The Daily Telegraph. Retrieved 15 January 2014. ↑ "Tom Hardy biography - Celebrity A-Zs GLAMOUR.com". Glamour.com UK. Retrieved 30 June 2013. ↑ Grainger, Lisa (18 April 2013). "Tom Hardy's Travelling Life". The Daily Telegraph. Retrieved 15 January 2014. ↑ "From misfit to Mad Max". Taipei Times. 9 January 2014. Retrieved 15 January 2014. ↑ Maher, Kevin (5 March 2009). "A tough life for Bronson actor Tom Hardy". The Times. London. ↑ Fisher, Alice (4 July 2010). "Tom Hardy: the rake's progress". The Guardian. London. ↑ "The U.K. movie star and the Vancouver tattoo artist he can't get enough of". The Globe and Mail. 23 August 2012. Retrieved 20 June 2015. ↑ Head, Steve (9 December 2002). "An Interview with Tom Hardy". IGN. Retrieved 4 June 2011. ↑ "Tom Hardy Biography". Biography.com. Retrieved 25 June 2015. ↑ "Tom Hardy: Real-life blows that shaped my acting". The Telegraph. Retrieved 31 December 2018. ↑ Dickens, Andrew (2011-09-18). "Meet Tom Hardy". ShortList. Retrieved 23 February 2017. ↑ Reynolds, Simon (16 September 2011). "'Tinker, Tailor, Soldier, Spy' Tom Hardy video interview: 'Gary Oldman is my hero'". Digital Spy. Retrieved 23 February 2017. ↑ "Tom Hardy wins modeling contest in 1998". Entertainment Weekly. 23 August 2012. Retrieved 25 June 2015. ↑ "Way Back When: Tom Hardy". screencrush.com. 8 November 2012. Retrieved 25 June 2015. ↑ "The Strange roles of Tom Hardy". /filmschoolrejects.com. Archived from the original on 12 May 2015. Retrieved 25 June 2015. ↑ "Tom Hardy's Rap Mixtape from 1999 Is Actually Kind of Fire - Noisey". Noisey.vice.com. 19 January 2018. Retrieved 20 November 2018. ↑ "Is Tom Hardy's 'Star Trek: Nemesis' screen test better than the finished film? -". Entertainment Weekly. 30 July 2012. Retrieved 25 June 2015. ↑ "An interview with Tom Hardy". ign.com. 9 December 2002. Retrieved 25 June 2015. ↑ "Evening Standard Theatre Awards: the rise of eight Outstanding Newcomers". Standard. 17 December 2014. Retrieved 25 June 2015. ↑ "Olivier Awards 2004". olivierawards.com. Retrieved 25 June 2015. ↑ "The Virgin Queen". BBC. Retrieved 25 June 2015. ↑ "A for Andromeda". BBC. Retrieved 25 June 2015. ↑ "The weekend's TV: Stuart: A Life Backwards". The Guardian. 24 September 2007. Retrieved 25 June 2015. ↑ "WAZ". Empire. Retrieved 25 June 2015. ↑ "Handsome Devil". /www.out.com. 30 October 2008. Retrieved 25 June 2015. ↑ "Guy Ritchie Has Finished 'RocknRolla' Sequel Script; Waiting On Schedule To Shoot". 13 December 2011. Retrieved 25 June 2015. ↑ "Actors Who've Gone Big". Empire. Bauer Consumer Media. 13 March 2009. Retrieved 8 December 2009. ↑ Allen, Kate (7 September 2009). "Coben, Cole, Atkinson vie for crime awards". The Bookseller. Archived from the original on 10 September 2009. Retrieved 7 September 2009. ↑ "Wuthering Heights "Is Mr. Heathcliff a Man?"". pbs.org. Retrieved 25 June 2015. ↑ "Heathcliff in Wuthering Heights". pbs.org. Archived from the original on 22 January 2009. Retrieved 25 June 2015. ↑ Jones, Kenneth (13 February 2010). "Tom Hardy Journeys Goodman's Long Red Road, a World Premiere, Starting Feb. 13". Playbill Web site. Archived from the original on 15 February 2010. Retrieved 22 March 2010. ↑ Potempa, Phillip (24 February 2010). "OFFBEAT: Goodman Theatre's 'The Long Red Road' is brilliant masterpiece". nwi.com. Retrieved 22 March 2010. ↑ Hieggelke, Brian (22 February 2010). "Review: The Long Red Road/Goodman Theatre". Newcity Stage. Retrieved 22 March 2010. ↑ "Tom Hardy Replaces Fassbender in Tinker, Tailor, Soldier, Spy". Comingsoon.net. 3 September 2010. Retrieved 15 January 2014. ↑ "Tom Hardy joins WB's first-look roster". Variety. 7 March 2012. Retrieved 15 January 2014. ↑ Ryan (13 October 2010). He was filming in Alvor, Algarve, Portugal through the summer of 2011 for this role as well as other locations throughout Europe. "Tom Hardy Joins Batman 3 Cast; Fury Road Delayed". reelzchannel.com. ↑ Zeitchik, Steven (7 December 2010). "Shia LaBeouf and Tom Hardy will be bootleggers". Los Angeles Times. Retrieved 10 February 2011. ↑ "Doug Liman To Helm 'Splinter Cell' With Tom Hardy". Deadline.com. 19 March 2014. Retrieved 20 June 2015. ↑ Graser, Marc (14 November 2012). "Tom Hardy game for 'Splinter Cell' movie". Variety. Retrieved 8 November 2013. ↑ "Riz MC - Sour Times". youtube. Retrieved 16 July 2015. ↑ Hoad, Phil (22 April 2015). "How is Tom Hardy's $50m Child 44 such a totalitarian fail?". The Guardian. Retrieved 21 February 2016. ↑ ""Mad Max: Fury Road" Review". 25 May 2015. Retrieved 15 June 2017. ↑ Rosenberg, Adam. "Tom Hardy landing the starring role in "Mad Max: Fury Road" is an amazing turn of events for that franchise". MTV. Retrieved 3 March 2011. ↑ "Tom Hardy gives new life to 'Mad Max'". USA Today. 14 May 2015. Retrieved 16 July 2015. ↑ "Review: 'Mad Max: Fury Road' an 'out-of-control reboot'". canadaam.ctvnews.ca. 15 May 2015. Archived from the original on 18 May 2015. Retrieved 16 July 2015. ↑ "Mad max Fury". rotten tomatoe. Retrieved 16 July 2015. ↑ "Mad Max: Fury Road". box office mojo. Retrieved 16 July 2015. ↑ "Tom Hardy wins Best Actor at British Independent Film Awards". 11 December 2015. Archived from the original on 15 December 2015. ↑ "The 88th Academy Awards (2016) Nominees and Winners". Academy of Motion Picture Arts and Sciences (AMPAS). Retrieved 14 January 2016. ↑ McNary, Dave (23 March 2016). "Harry Styles, Fionn Whitehead to Star in Christopher Nolan WW2 Action-Thriller 'Dunkirk'". Variety. ↑ Swift, Andy (23 November 2015). "Tom Hardy's FX/BBC One Drama Taboo Adds 13, Begins Production". TVLine. Retrieved 11 August 2018. ↑ "Tom Hardy Is Signed for Three Venom Movies". CBR. 25 August 2018. Retrieved 29 August 2018. ↑ "Tom Hardy signed for three Venom films". www.msn.com. Retrieved 29 August 2018. ↑ "Venom & Black Cat Movies Will Be 'Adjuncts' to the MCU's Spider-Man". 18 June 2017. ↑ Kroll, Justin (10 October 2016). "Tom Hardy to Star in 'Spider-Man' Movie 'Venom,' Ruben Fleischer to Direct". Variety. ↑ Hipes, Patrick (30 October 2016). "Tom Hardy To Play Al Capone In New Movie 'Fonzo' From Josh Trank – AFM". Deadline. Retrieved 29 October 2016. ↑ Mike Fleming Jr (2016-06-22). "Tom Hardy To Play War Photographer Don McCullin In Working Title Drama | Deadline". deadline.com. Retrieved 12 November 2016. ↑ "Tom Hardy & Charlotte Riley Are Expecting, & Their Children Are Going To Be So Beautiful". Bustle. 3 September 2015. Retrieved 7 January 2017. ↑ "Tom Hardy 'wasn't a fan of school'". The Belfast Telegraph. 14 March 2014. Retrieved 3 May 2014. ↑ Davies, Serena (11 June 2009). "Interview: Tom Hardy, from East End gangster to romantic hero". The Daily Telegraph. UK: Telegraph Media Group Limited. ↑ Lauren Smith (22 September 2014). "Tom Hardy got married in secret - two months ago". Glamour. Archived from the original on 21 October 2014. Retrieved 21 October 2014. ↑ "Tom Hardy Expecting Second Child!". 2015-09-03. Retrieved 3 September 2015. ↑ Sabrina Barr (2019-01-11). "Tom Hardy and Charlotte Riley 'name newborn son after Forrest Gump'". The Independent. Retrieved 2019-01-12. ↑ Rebecca Macatee, "Tom Hardy Gets a Kiss From His Dog Woodstock in Pro-Adoption Campaign for PETA—See the Pic!" EOnline.com, 28 April 2015. ↑ "I first saw Woodstock running across a turnpike we... - tomhardydotorg". Tom Hardy Dot Org. Retrieved 10 June 2017. ↑ "Hollywood star Tom Hardy has paid a special visit to the capital to meet disadvantaged young people supported by The Prince's Trust". Retrieved 16 July 2015. ↑ "Actors Tom Hardy and Charlotte Riley become patrons of Bowel Cancer UK". 13 July 2012. Retrieved 16 July 2015. ↑ "When are Prince Harry's Invictus Games and what are they?". The Daily Telegraph. 8 May 2016. Retrieved 2 October 2016. ↑ "Debrett's 500 List: Film". Debretys. 21 May 2017. ↑ "Dalglish and Thompson head honours list". BBC News. 8 June 2018. Retrieved 8 June 2018. ↑ "Tom Hardy: I was lucky I didn't get AIDS from drug use". Yahoo!. Retrieved 31 March 2017. ↑ "Actor Tom Hardy reveals past addictions still haunt him". Chrysalis Courses. Retrieved 20 November 2018. ↑ "Bronson - Tom Hardy Online". Tom Hardy Online. Retrieved 31 March 2017. ↑ "An Oliver for our times". The Daily Telegraph. 15 December 2007. Retrieved 25 June 2015. ↑ Billington, Michael (28 April 2003). "In Arabia, We'd All Be Kings". The Guardian. Retrieved 2 August 2012. ↑ Jaquest, Oonagh (13 June 2003). "Review: The Modernists". BBC. Retrieved 14 January 2017. ↑ Hickling, Alfred (17 June 2003). "The Modernists". The Guardian. Retrieved 14 January 2017. ↑ "Blood at the Royal Court Theatre". Royal Court Theatre. 2003. Archived from the original on 29 October 2010. Retrieved 3 May 2014. ↑ Clapp, Susannah (28 March 2004). "Festen". The Guardian. Retrieved 14 January 2017. ↑ Sierz, Aleks (3 February 2007). "From rehab to Restoration comedy". The Daily Telegraph. Retrieved 20 June 2015. ↑ Oxman, Steven (22 February 2010). "Review: The Long Red Road". Variety. Retrieved 14 January 2017. Dempster, S (22 September 2007). "Tom Hardy tastes the hard life". The Times. UK. Retrieved 3 October 2007. Wikimedia Commons has media related to Tom Hardy.